Wang, who completed graduate studies at the Central Academy of Fine Arts in Beijing, teaches at Baotou Teachers College, Inner Mongolia University of Science and Technology. 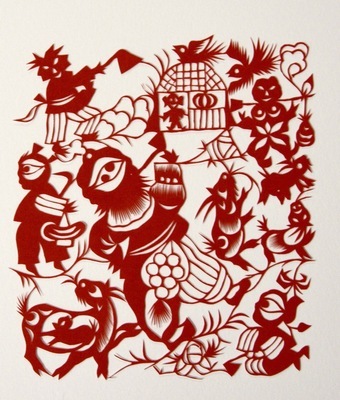 In 2007, Wang was among four Chinese paper-cutting artists invited by the Ernst Hohl-Culture Foundation to participate in a China-Switzerland cultural exchange program and commissioned to produce paper-cuts related to observations of Swiss folk life while visiting that country. The works produced by Wang and the other Chinese artists were eventually shown in Zürich, Beijing, and Hangzhou. In 2009, Art & Design faculty member Dr. Crystal Hui-Shu Yang received a University grant to visit Wang in Inner Mongolia. Yang then invited the paper-cutting artist to UND through the Department of Art & Design’s Visiting Art Program. Wang’s paper cut was made specifically for the artist’s UND solo show that coincided with the Chinese New Year in 2010.